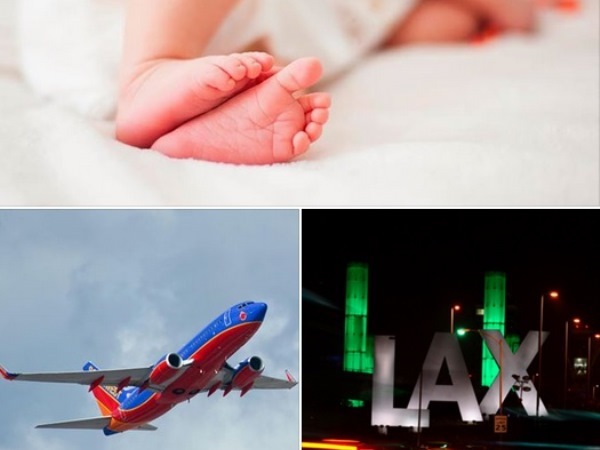 A passenger gave birth shortly after Flight 623 took off from San Francisco on Tuesday and the Phoenix-bound jet diverted to Los Angeles International Airport. Post by KTLA 5 News. The woman was assisted by the flight crew and a doctor and nurse who were aboard, airline spokeswoman Emily Samuels said. She said hopefully the airline has a new customer for life. Paramedics boarded the aircraft and the mother and newborn, whose names have not been released, were taken to a hospital in good condition, Los Angeles Fire Department spokesman Erik Scott said. Passenger Julie Dafoe said she and Kurt Reed were sitting next to the woman. "One of the nurses that helped she said she was like walking around pacing in the airport so they were thinking she was having contractions," Dafoe told Phoenix TV station KTVK. "All of a sudden I heard a baby cry like a gurgling sound, like a baby that had too much milk or whatever and I'm like 'There's no babies on this flight,'" Reed said. Passengers said they had heard the call for a doctor, but nothing about what the medical emergency was. "The captain announced congratulations for the arrival of this new baby boy," another passenger Aarti Shahani told KTVK. "So we all started applauding, but it was confusing because we thought someone was going to die not be born." Call the ambulance. Find out which maternity institution the mother-to-be has been booked into. Time the contractions and check how far she’s dilated. If the contractions are two minutes or fewer apart the mother is ready to deliver the baby. If the head of the baby is coming out, get the mother to lie on her back with her knees apart. Place pillows beneath her to make her comfortable. Try to stay calm and also reassure the mother everything will be ok.
Wash your hands and get ready to catch the baby. Use antibacterial soap/sanitisers and warm water to scrub your arms. Scrub your arms right up to your elbow. Wear rubber gloves if you have them. Have a clean blanket and towels ready for the delivery. Don’t pull the baby’s head out when it comes out; support the head. If the cord is wrapped around the neck, try to gently lift it over the baby’s head. You must keep the baby on the same level as the placenta or afterbirth, because if the baby is higher than the placenta it won’t receive a good blood supply or oxygen. Once the baby is out, place it on the mother’s chest and flick the soles of its feet with your fingers to make sure the baby is breathing. It should be crying. Don’t cut the umbilical cord. Let the paramedics do it.